APTA introduces a new program called ASEP [APTA Student Education Program], which enables us to help poor and needy students back home. APTA would strive to connect a benevolent and generous donor to a bright and needy student. On a regular basis, ASEP committee collects a list of economically backward students, who are exceptionally doing well in their studies/academics, but coming from the families that are too economically weak to support their kids’ educational expenses. 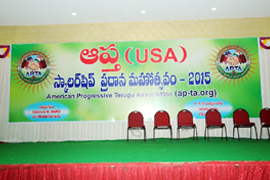 APTA renders partial/full support to the selected students on an annual basis. If any of you come across such exceptional students with an abject poverty background, kindly forward their details to apta-exec@googlegroups.com.